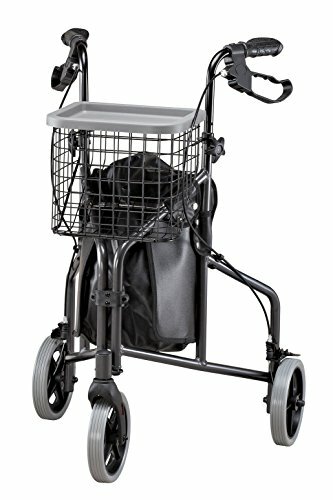 Lightweight 3 wheel aluminum rollator lends a helping hand on the go, then folds in seconds for easy travel and storage. 3 wheeled walker is easy to maneuver, with 8" smooth-rolling wheels and ergonomic hand grips with locking loop brakes. Comes fully loaded with features to store all your mobility essentials, including an easy-to-remove tray with shopping basket and bag. Rollator walker folds to just 10"W for easy travel and storage. Measures 25"W when open, 20"W inside rear legs. Handles are 10" apart and adjust from 34" - 38 1/2"H. Lightweight rollator weighs just 13.2 lbs. yet supports up to 250 lbs. evenly distributed. Minimal assembly required; instructions included. Add $5 to shipping charge.